One of the most historically significant cities west of the Mississippi River, Tahlequah was the end of the \"Trail of Tears\" for the eastern Cherokees. Since 1841, Tahlequah has been the capital of the Cherokee Nation and has been strengthened by its historic origin. Located in the rolling Cookson Hills between the scenic Illinois River and beautiful Lake Tenkiller, the Tahlequah area is a sportsman\'s paradise and a mecca for outdoor recreation. Year-round activities range from rodeos to dogwood tours, from Broadway shows to pow wows, from fall foliage tours to community theatre, from festivals to fishing tournaments. Summer months bring visitors from around the world to float the river, tour the living Tsa-La-Gi ancient village, stroll through outdoor arts and crafts shows, sing along with the River City Players at the NSU Playhouse, and swing to the sounds of jazz at the NSU Jazz Lab. Tahlequah is the home of Northeastern State University, an innovative, progressive institution which has emerged as the fastest growing university in Oklahoma. Since 1987, the Tahlequah area has been ranked the 4th best all-round retirement location in the United States based on studies of climate, health care facilities, and reasonable cost of living. Various stories are told about the origin of the name Tahlequah. The most plausible one is that it comes from the old Cherokee town Ta-lik-wa in Tennessee. 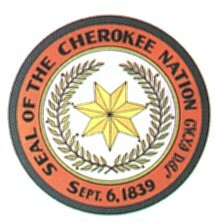 A more colorful version is that after the newly-arrived Cherokees and the Western Cherokees united into one nation, they decided that several of them would meet on a certain day at a certain time to select a site, and a name for the capital of the new government. Heavy rain fell the day before the meeting and flooded the rivers. Only two Cherokees managed to get to the site. They waited most of the day for others to arrive. One asked the other what they should do. The reply was Tah-le-ya-quah.\" \"Tah-le\" is the Cherokee word for \"two\", and \"ya-quah\" the word for \"enough\" or \"plenty,\" meaning that two were enough to locate and name the capital. History is one of Tahlequah's most valuable resources, much of it in the history of the Cherokee Nation ... to a Civil War cabin ... to homes of townspeople at the turn of the century. This four-year regional university has a long and colorful heritage which began in 1846 when the Cherokee National Council authorized establishment of the National Male Seminary and National Female Seminary. Here in September, 1885, the first telephone in Oklahoma was connected for service. It was the first telephone in the Mississippi Valley west of St. Louis. The company was organized by a group of Cherokees, namely, D.W. Lipe, L.B. Bell, R.M. Wolfe, J.S. Stapler, J.B. Stapler, and E.D. Hicks.